Everything was going along perfectly for Bo Stern, until the day her husband was diagnosed with motor-neuron disease. And in an instant, she found herself out on a battlefield. Some beautiful things can only be found in the hardest times. Can you turn that idea around in your mind for a bit and let its size and scope seep in? God is for us. He is for our growth, our joy, our success, and our maturity, and He will use every struggle we face as the delivery agents for His most remarkable gifts. 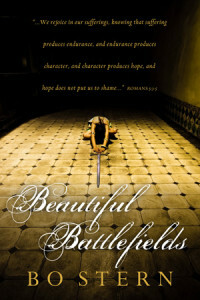 Our beautiful God has hidden beauty in the soil of our battlefield. He has placed treasure there that we simply would not be able to find in other, more peaceful places. Before we faced this fight, I knew this in theory, but I hadn’t experienced a fire hot enough to prove and refine it. Now I can say with great confidence, I own it. On good days and on bad, in war and in peace, in sickness and in health, I know in the deepest part of my heart that He is the God who brings beauty from battle. The power of this book lies in the fact that Bo is writing it from her vantage point in the midst of a terrible battle. No glib platitudes or shallow theories. Just a real, gritty, Spirit breathed understanding that can only come from out there on the battlefield. She grapples with issues and shares insights that will warm your heart, strengthen your soul and fill you with hope. This book is for anyone who needs to make some sense out of their suffering. Available from Amazon in hard copy or as a Kindle eBook. Berni, just yesterday I was listening to Radio National and the biographer of Joe Kennedy, David Nasaw. One stark contrast made by David was between Joe and Rose Kennedy. She was an extremely Faith driven Roman Catholic and was through the Grace of that Faith able to be sustained through being pre-deceased by her three sons (two assassinated) and a daughter. The biographer was amazed by her composure. Perhaps she too was able to see God with her in all her circumstances – both good and bad? Will definitely buy Bo’s book.